For over a decade, Holiday Illumination LLC. and Highlights has been designing and installing the highest quality displays all over the Las Vegas area. Our team maintains the highest standards of work, from design conception to completion of the job. Holiday Illumination and Highlights has made a name for itself within the commercial market by providing quality workmanship and results. From community associations, commercial offices, and retail centers; Holiday Illumination and Highlights handles all lighting and decorating jobs with unmatched professional results. Our residential and commercial customers instill trust and confidence in us because of our experience, promptness, and professionalism. Qualities like these have helped us grow and succeed to be the most prestigious indoor and outdoor decorator around. Our design team has many different options to choose from to decorate any type of property. We are an exclusive distributor for one of the finest qualities of commercial décor products on the market and we are confident that you will be impressed with our selections. 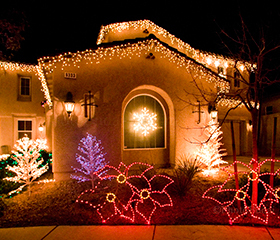 Whether it is a custom Halloween decoration or an elaborate Christmas lighting ceremony, Holiday Illumination and Highlights is a convenient solution to enhance everyone's holiday spirit. 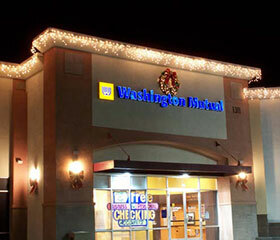 Holiday Illumination is your #1 choice when it comes to providing and installing indoor and outdoor décor.